I missed Thursday, media day at Architectural Digest's annual Design Show. I was working (meetings and an appearance at Essence Live! to talk pop culture). But I cancelled everything on Friday to swing bybefore the weekend crowds. I've been waiting for this event. And it was soooo worth walking five avenues from the nearest subway station, and the price of admission ($30 in advance, $40 at the door). I'm headed back over today (Saturday) because 1) the tickets are for good the entire weekend; and 2) I was on Facebook last night, saw some sick interior design images and asked, "where is that?" Apparently, I missed a whole huge section of the (humongous) exhibit. Womp. So, back to the design show today. I know, I know. Poor me! LOL! I'll do a follow up post on whatever awesomeness I find later. Take a look at my favorite pics from Dining by Design, a subset of the larger show (and in a separate building). It's decor for dinners and celebrations. There were some awesome pieces at the main show, but Dining by Design is where the glory is. First up ? A slice of greatness from Kravet Inc. Get into those patterns, especially the chairs! A taste of all white everything from Bloomingdale's. Those chairs and ottomans, tho? Say word. Orchids ain't so bad either. The next room, by Architectural Digest, was a bit controversial. I posted an image on Instagram and referred to it by what the accompanying placard said. 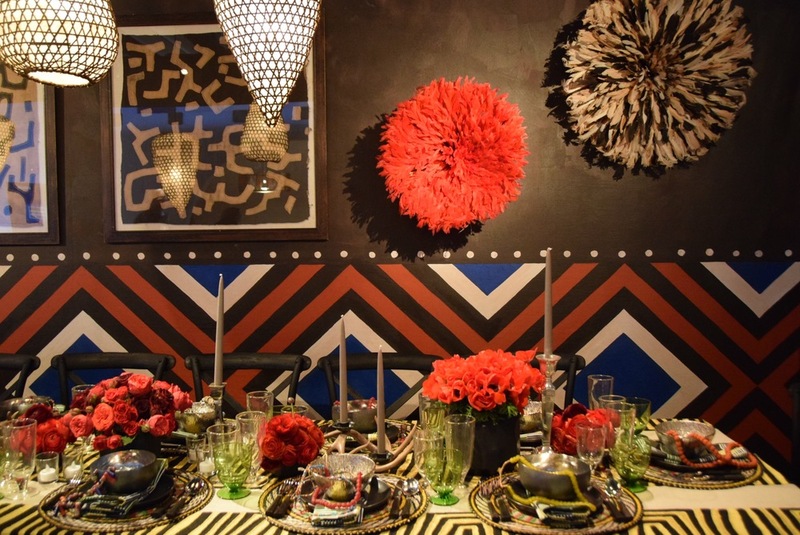 It's an "African-inspired" room. Some readers took issue that an entire continent with so many cultures and continents, was being cited as the influence. It's a valid point, but do we make it when something is called, "European-inspired" or "Asian-influenced?" Maybe because those aren't often the culture that so many trace back to, we don't take offense. Should we here? Hmmmm. Anyway, the room was dope. And I loved the Juju headdresses (ie. the feather circles on the far right). I saw a pair in a friend's house once and have been obsessed ever since. They're native to Cameroon, which is on my travel bucket list. Anyway. This? Divine! Slow clap for the kids at Pratt. A dreamscape from Arteriors Home: *swoon* Mirrors, mirrors on the walls! A blue room! I immediately thought of Blue Man Group, which is obviously NOT the inspiration for Sunbrella, but.... a worth monochromatic Moment! Big M.
Beautiful black and white from Nourison. I NEVER thought of jelly fish for decor, but it works. Well. Who knew? Maybe the theme here is under the sea. Not like Ariel, like the deep part that gets no light. The New York School of Interior Design went wild (and futursitic) with geometric patterns. Unfortunately, I didn't catch the name of the design house for this room. (Sorry!) But would you look at these patterns?! It reminded me of a luxe safari. It's the animal prints. Last but not least from Dining by Design, a tablescape from Baccart crystal. Mind blown! Oh, and a most honorable mention to Teri over at Harlem Candle Company, who was at the general design exhibit to showcase her candles (buy the "holiday", trust me), but came thru with the best design in show with this vintage Harlem-influenced parlor. She slays. Also, check out this 1932 map of where to party in Harlem that ran in Esquire magazine. When you purchase a candle, you'll find the map printed on the inside of the box. There are also candle... vases? Is that the right word? I dunno. But there are candle holders with the map on them so you can take home a piece of American history/geography. What did you think of Dining by Design?